Making its debut in early 2014 with seven night Caribbean cruises from Miami, Norwegian Cruise Line's next ship in the Breakaway Class, the Norwegian Getaway will feature what the company is calling a major innovation in design; A quarter-mile-long ocean-facing boardwalk lined with restaurants, bars and shops. The Waterfront, as the area will be called, will span both sides of the ship and boast eight outdoor dining and lounging options, including a steakhouse, an Italian eatery, a seafood restaurant, and a cocktail bar. Tied into the outdoor Waterfront, the complexes will have 17 dining venues and 12 bars and lounges. The Getaway will offer its guests a wide variety of cabins for all types of travelers to call home, from the innovative Haven concept, a brand new 42-suite private complex, to studios for guest traveling alone. The Getaway will also enhance its family image with the deck top Aqua Park, a massive water park featuring five water slides. 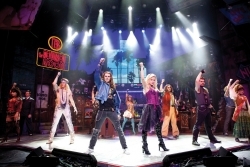 As always, as is the tradition of Norwegian Cruise Line, family entertainment will be a prominent feature aboard the Getaway with the addition of some favorite Broadway shows such as Rock of Ages and Burn the Floor, with many more exciting features to be added. Enjoy amazing ocean views and an extra-spacious balcony. These Suites include a king-size bed, additional bedding that accommodates two, and one and a half bathrooms. Located in The Haven. (Sleeps up to four). Book any 3+ Night Cruise in a Studio or Inside and Pick One, Book an Oceanview, Balcony, or Mini-suite and Pick Three, Book a Suite or Haven stateroom and Get All Six! For a limited time, book a select 5+ night cruise and receive up to $500 FREE onboard spend. Offer is not applicable to categories BX and MX (Sail Away Categories). Valid on 3+ night sailings. Free at Sea choice(s) must be selected at least 24 hours prior to sailing and cannot be changed on board. Bookings made within 24 hours to departure can choose promotion at time of booking. Offer is capacity controlled and can be withdrawn at anytime. Singles paying 200% of voyage fare qualify. Anything consumed above the promotional benefit will be the responsibility of the guest at prevailing rates. Guest cannot substitute or customize this offer. All guests in stateroom must choose same offer. Government taxes, port expenses & fees, discretionary onboard service charges and/or gratuities are additional. Cancellation Fees also apply based on the booking/sailing date; therefore, Norwegian Cruise Line strongly recommends the purchase of travel protection on all bookings. Not applicable to chartered dates and group types: CMI OP EVENT, CMI OP LG EVENT, INCREG & INCLARGE This is a cruise only offer. This promotion is not applicable on the land portion of Cruisetours or bundles. No components included in this offer have any monetary value, are non-refundable and non-transferable. Offer and combinability with other promotional offers is subject to change at any time per Norwegian Cruise Line's discretion. Other restrictions may apply. Norwegian Cruise Line reserves the right to cancel or withdraw this offer at any time. Applicable to NCL MIAMI. Not applicable to NCL INTL, AUSTRALIA, NCL BRAZIL, NCL ASIA or CE and UK offices.